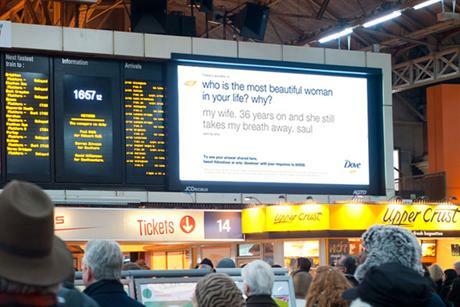 Beauty brand Dove has set up a screen in Victoria train station to target commuters over Valentine’s Day. The board encourages people to tweet or send SMS replies to different questions posted on the screen each day as part of Dove’s real beauty campaign. Examples of the questions asked include “who is the most beautiful woman in your life and why?” and “what makes you feel beautiful?” and the replies are displayed on the board for travellers passing through the station to read. Brand ambassadors were also at Victoria station today handing out white tulips for people to give to their Valentine and they will be giving out other gifts relating to the question throughout the week. Victoria station sees 350,000 people travel through each day and the campaign, which began yesterday, is running on a JCDecaux transvision screen. The social media campaign was created by Billington Cartmell and will run until the 19th February.